I thought you might find this court opinion of interest. It is from the Court of Common Pleas in Jefferson County, PA, and seems to be the trend regarding discovery of social networking sites. A link to the opinion is included below along with some of the key language from the opinion. Facebook, MySpace, and their ilk are social network computer sites people utilize to connect with friends and meet new people. That is, in fact, their purpose, and they do not bill themselves as anything else. Thus, while it is conceivable that a person could use them as forums to divulge and seek advice on personal and private matters, it would be unrealistic to expect that such disclosures would be considered confidential. Both sites at issue here do guarantee a modicum of privacy insofar as users may, with the exception of certain basic information, choose what information and posts to make public and which ones to share with only those persons they have identified as friends. Yet reading their terms and privacy policies should dispel any notion that information one chooses to share, even if only with one friend, will not be disclosed to anybody else. Returning to the four factors identified in Matter of Adoption of Embick, it is clear that no person choosing MySpace or Facebook as a communications forum could reasonably expect that his communications would remain confidential, as both sites clearly express the possibility of disclosure. Confidentiality is not essential to maintain the relationships between and among social network users, either. The relationships to be fostered through those media are basic friendships, not attorney-client, physician-patient, or psychologist-patient types of relationships, and while one may expect that his or her friend will hold certain information in confidence, the maintenance of one’s friendships typically does not depend on confidentiality. The Court cannot say, therefore, that the community seeks to sedulously foster friendships by recognizing friend-to-friend communications as confidential or privileged. No such privilege currently exists. Friendships nonetheless abound and flourish, because whereas it is necessary to guarantee people that their attorneys, physicians, and psychologists will not disseminate the substance of their discussions in order to encourage the type and level of disclosure essential to those professional relationships, history shows that the same guarantee is not necessary to encourage the development of friendships. 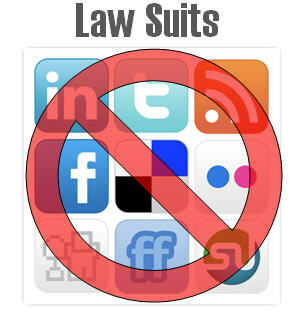 Furthermore, whatever relational harm may be realized by social network computer site users is undoubtedly outweighed by the benefit of correctly disposing of litigation. As a general matter, a user knows that even if he attempts to communicate privately, his posts may be shared with strangers as a result of his friends’ selected privacy settings. The Court thus sees little or no detriment to allowing that other strangers, i.e., litigants, may become privy to those communications through discovery. The countervailing benefits, moreover, cannot be overstated. Take this case, for instance. McMillen has alleged significant and substantial injuries, some of which he claims may be permanent. Accessing only the public portion of his Facebook page, however, the defendants have discovered posts they contend show that McMillen has exaggerated his injuries. Certainly a lack of injury and inability is relevant to their defense, and it is reasonable to assume that McMillen may have made additional observations about his travels and activities in private posts not currently available to the defendants. If they do exist, gaining access to them could help to prove either the truth or falsity of McMillen’s alleged claims. The same may be true in any number of cases. Millions of people join Facebook, MySpace, and other social network sites, and as various news accounts have attested, more than a few use those sites indiscreetly. See e.g., The Independent, Facebook can ruin your life. And so can MySpace, Bebo . . ., http://www.independent.co.uk/life-style/gadgets-and-tech/news/facebook-can-ruin-your-life-and-so-can-myspace-bebo-780521.html (02/10/2008) (Discussing some of the potential social, career, and legal ramifications of inappropriate social computer networking). When they do and their indiscretions are pertinent to issues raised in a lawsuit in which they have been named,the search for truth should prevail to bright to light relevant information that may not otherwise have been known. Where there is an indication that a person’s social network sites contain information relevant to the prosecution or defense of a lawsuit, therefore, and given Koken’s admonition that the courts should allow litigants to utilize “all rational means for ascertaining the truth,” 911 A.2d at 1027, and the law’s general dispreference for the allowance of privileges, access to those sites should be freely granted.